I have Directed, Produced, Filmed, and Edited films from New York To Berlin. If you are looking to produce a small film in Berlin please contact me, and we can discuss how best to make you dreams physical film reality. The Living Theatre presented a New Science production by NAPOLIWOOD, a film production company based in Naples, Italy, together with LORETTA AUDITORIUM, a New York-based theater production company of The Man Who Appear**ed.–a live filming on a soundstage open to the public through the lens of the theater. The Man Who Appear**ed. is inspired by a short story by Brazilian author Clarice Lispector. It is about a woman whose life is shattered by the sudden appearance of an old acquaintance. The woman, a successful writer, is confronted with the specter of a man whom she remembers as a talented and promising poet, now a down-and-out alcoholic–a failure. 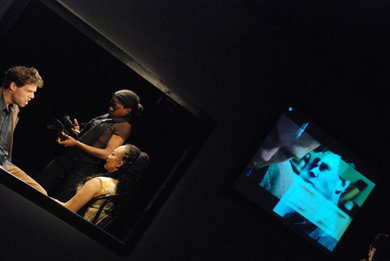 The film shoot shares the stage with a theater performance. Is it a play becoming a film or a film becoming a play? The event becomes a hybrid vehicle for scripted and improvised investigations. Will the audience lean back in critical contemplation as theater-goers, or will they surrender to the compelling illusion of the screen narrative? Meanwhile the actors and crew must satisfy two masters: the camera and the live audience. The production will present rushes of the day–takes, improvisations, and fragments from the writer’s experiences as she chooses, selects, organizes, and refines in the process of creation. The theater is the vehicle that transports the story into recorded fiction. The audience, actors, director, and film crew collaborate to organize a narrative from the disorganized fragments of a human life. From the daily news to our daily lives to what we remember from our dreams–it’s all in the editing. Geography might not be fate – although an old saying assures us it is – but it can be darned convenient at times. Say, for instance, you work at a charter school in Baltimore, (which means you’ve boldly gone where few public schools in this town have gone before). Let’s just say your address happens to be – and this is chosen completely at random (wink, wink) – 1398 Mount Royal Ave. Let’s say further that you want a documentary done about your charter school and three others. What do you do? Why, go right across the street to Maryland Institute College of Art, of course, and talk to the folks in its video department. That’s just what George Nilson, the board chairman at Midtown Academy – which by curious coincidence (wink, wink) is located at 1398 Mount Royal Ave. – did. He approached folks in MICA’s video department about making a film with four Baltimore charter schools as the subject. And that’s just why at 8 a.m. tomorrow, anyone who takes a notion to can go to Falvey Hall in the Brown Center at MICA to view the 20-minute film Public Schools of Choice: the Charter Schools of Maryland. Catherine Curran O’Malley, a Baltimore District Court judge and the mayor’s wife, will give the opening speech. “I really thought it would be a good way to put the story together and get the word out,” Nilson said of the film. For Moore, that word is basically this one: choice. Sitting at a computer in MICA’s video department last week, Moore tried to boot up several scenes from the documentary. But he’s an old-school filmmaker. He needed the help of two of his students, Asoka Esuruoso and Garrett Guidera, to work the computer controls. Once that was done, Moore showed several scenes of faculty members from each school talking about the mission of charter schools. One teacher said, “Here at Patterson Park, we’re the new voice of educational choice.” When the clips were done, he turned to me. “The key word you heard is choice,” Moore said.